Saskatoon, Canada (CNN) - The most famous export of a college town on the Canadian prairie is folk singer Joni Mitchell. But a stranger to Saskatoon, the largest city in the province of Saskatchewan with a population around 250,000, might never realize that Mitchell was from here. There are no plaques or murals in honor of the city's most successful daughter, and a 2013 attempt to erect a Joni Mitchell museum fell apart in spectacularly embarrassing fashion when the city didn't have enough money to follow through. Now, as Mitchell is plagued by ill health -- she suffered a stroke in 2015 -- the city that shaped the singer-songwriter's early work is at last formally recognizing the singer-songwriter of "Help Me" and "Big Yellow Taxi" ahead of her 75th birthday in November with a waterfront park and a celebration in her honor. In the local paper, the Saskatoon Star Phoenix, reporter John Gormley once referred to Mitchell and Saskatoon as "star-crossed lovers, each wanting to do the right thing, reaching out but saying the wrong thing, second guessing, keeping track of slights and eventually no one can remember how things got so screwed up." Canadians are known for their humility, and that goes extra in Saskatoon, a city whose "Paris of the Prairies" nickname wasn't coined by a local. It came from an interview Bob Dylan did after he first played in the city and was later immortalized in a song by those heroes of the Great White North -- the Tragically Hip. But its self-deprecating character can sometimes hurt when it comes to honoring its history and being proud of its celebrity citizens. These days, though, the air feels different in Saskatoon when you travel here. The city is the fastest-growing in Canada, and current Mayor Charlie Clark won election in 2016 on a platform of bringing in young families and championing diversity. The ambitious, expansive Remai Modern art museum opened in 2017 to acclaim that helped secure the city a spot on "The New York Times'" list of best places to visit in 2018. The time for a reckoning has come. On the eve of her 75th birthday, Mitchell is said to be in poor health, and she rarely travels or makes public appearances. ESPN sportscaster Roy Firestone reported in June that he spotted Mitchell at her friend James Taylor's concert at the Hollywood Bowl in Los Angeles using a wheelchair, and a photo of the two musicians embracing has gone viral. Now, finally, she and the city of her childhood have reached an agreement about her legacy. A section of the city's South Saskatchewan River waterfront will be named in the singer's honor on June 10, bringing an end to decades of awkwardness and mismanagement. Mayor Clark, a self-professed lifelong Joni Mitchell fan, has been one of the project's biggest champions. He notes that Mitchell wrote the lyrics to her beloved song "River" at the very spot where the plaque bearing her name will stand. And he's no fair weather fan, despite mostly growing up in British Columbia. Mitchell, who began playing guitar and piano as a child in Saskatoon, eventually moved to the United States and became a hugely influential figure in the folk music scene. Her fourth album, "Blue," propelled her into superstardom and remains a hit today -- in 2017, NPR named it the greatest album by a female artist ever. She has won nine Grammy Awards, including one for Lifetime Achievement in 2002. But for Saskatonians, Joni will always be the girl who loved to go dancing on the weekends. When asked about his own Mitchell memories, Clark doesn't hesitate. Like many fans, he has specific songs connected to specific memories: "A Case of You" and a first breakup; "The Circle Game" played on road trips with friends. Walking along the Broadway Bridge that connects the eastern and western districts of Saskatoon, Clark points out some of the landmarks associated with Mitchell's songs. The Empire Hotel, where her song "Raised on Robbery" takes place, is now a homeless shelter called The Lighthouse; the song "Cherokee Louise" was about Mitchell's real childhood experiences playing with a friend in a tunnel underneath this very bridge. The musician ruffled feathers in 2013 by giving an interview where she said that "Saskatoon has always been an extremely bigoted community." "The First Nations community here has said [that] Joni Mitchell was a prophet," Clark says. Mitchell has long been a champion of First Nations rights in Canada and insisted that the community be involved in any tribute to her. "She was writing and speaking about these issues, like the humanization of "Cherokee Louise," and in some of her songs, she talks about the city changing and Indian land being stolen." In addition to the new waterfront, the Broadway Theatre, a longtime staple of local nightlife that began as a cinema where the young Mitchell watched movies with friends, will place a plaque in her honor. Next door, the French restaurant Calories is in the building that was once home to the Louis Riel Cafe, where a teenage Mitchell worked as a waitress and played her first paid gigs. The cafe's name was appropriate for Mitchell: the real Louis Riel was a Métis community leader who led a rebellion against the European settlers. He too was seen as a rabble-rouser during his lifetime and is now considered a Canadian national hero. The parallels are impossible to ignore. Mitchell was a guest there. On the cover of Clark's favorite Mitchell album, "Clouds," there's a portrait she painted of herself in Saskatoon, with the castle-esque Bessborough in the background. "She would order the all-day breakfast super late in the afternoon with a six-cup coffee urn," Oborowsky tells CNN Travel. "We would never hear from her before 11 a.m."
Once, to Oborowsky's delight, she was invited in to smoke American Spirit brand cigarettes with her idol. Other residents told of seeing her in the back row of a theater hiding underneath a hat, of remembering an elementary school classmate or a neighbor. 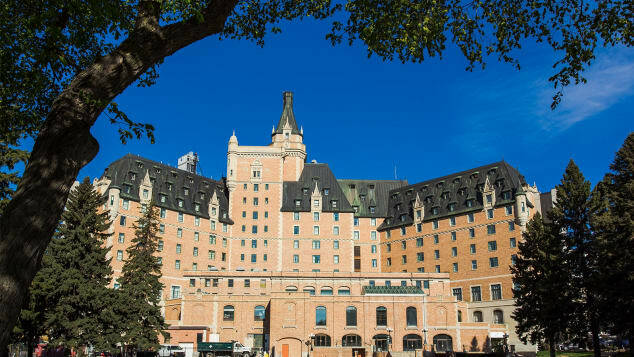 Saskatoon's Bessborough Hotel was immortalized on a Joni Mitchell album cover. Now, at last, these individual stories will build to become a shared narrative. And despite having her legacy literally carved into stone, the job of honoring Mitchell in Saskatoon isn't over. The University of Saskatchewan will honor Mitchell with an honorary Ph.D this fall, the first time they have awarded an honorary degree in absentia. Clark has his own suggestion for an additional Mitchell tribute. "One thing that I'm imagining is, take a spot like right here [on the Broadway Bridge], and you have a booth where you could put "Both Sides Now" on. Put on headphones, stand here and look at the clouds." This article has been viewed 801 times since being added on June 10, 2018.